Comments: American Coots are often mistaken for ducks and are one of the most common and visible waterbirds in the Great Plains. Their long, lobed toes are distinctive and assist with swimming. Clumsy on land, coots are reluctant fliers and must run across the water surface to become airborne. They have a white frontal shield and the white bill sometimes shows a reddish-brown or black ring toward the tip. At the base of their tails they have a small white patch on otherwise dark bodies. In flight they may show white trailing edges along the secondary feathers. Breeding adults can be aged based on the color of their legs. Green-legged adults are probably in their first year of breeding while red legs indicate at least a 4-year old bird. Young chicks have downy black bodies, red and blue skin and reddish-orange curly fluff on their heads. 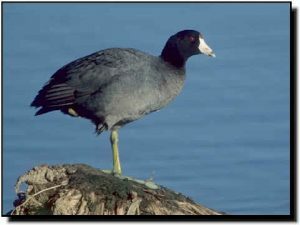 American Coots are primarily herbivorous, although they opportunistically feed on aquatic invertebrates and small fish. They are most common in clear marshes and ponds.